If you follow along with us regularly then you know we had our first baby, a little girl, a few months ago. We are loving being parents and soaking up all the smiles, giggles and snuggles. She is a sweetheart and is spoiling us with her love of sleep. I am still working on adjusting to the working from home mom role which I will talk about more next week. 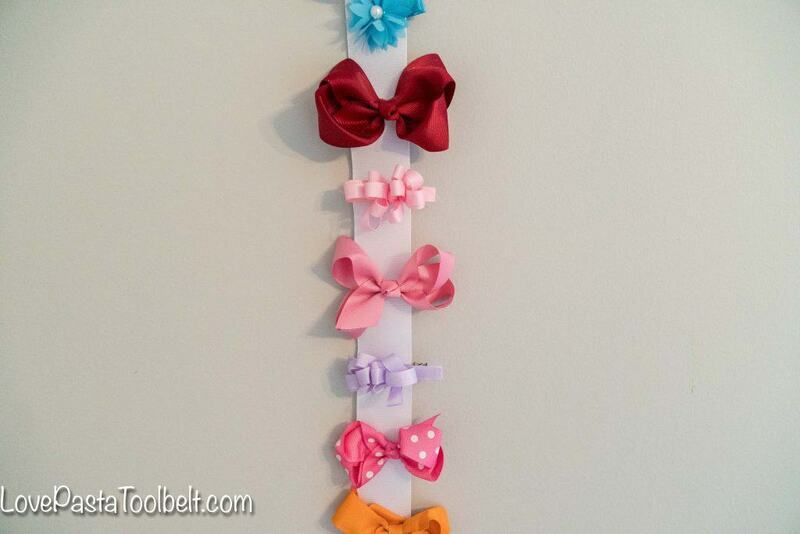 But for today, I have a fun craft that I created for our little girls room, a DIY Bow Holder. Our sweet K was born with a head full of hair. I was so happy and it made all that heartburn worth it. 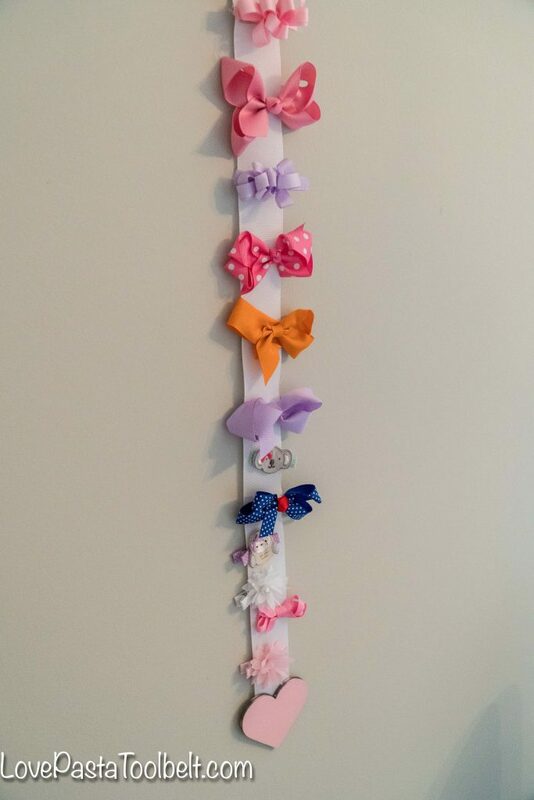 To say she has a lot of headbands and bows would be an understatement. I have a bit of a problem with buying them anytime I see a cute one. 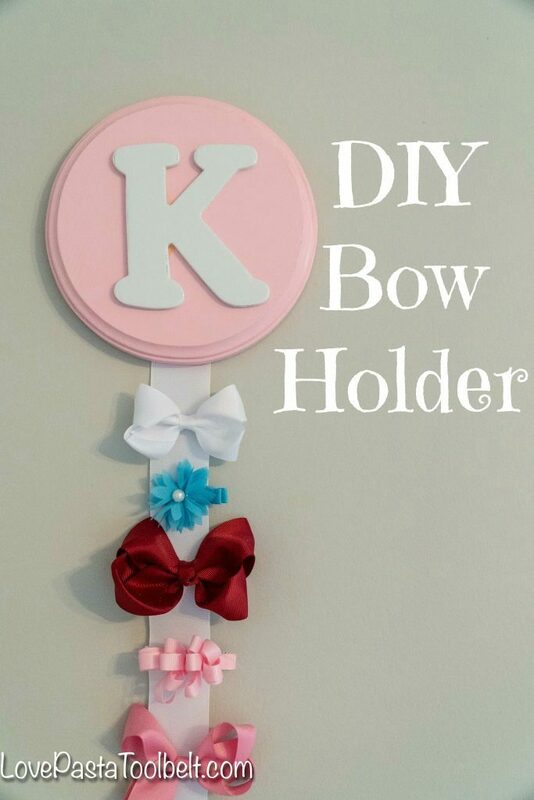 I knew I needed some way to keep them all organized or I would never know which colors I had and would constantly be digging through the basket I had them in, so I came up with this DIY Bow Holder. I’m still working on a solution for the headbands. 1. The first step was to spray paint the different wood pieces. 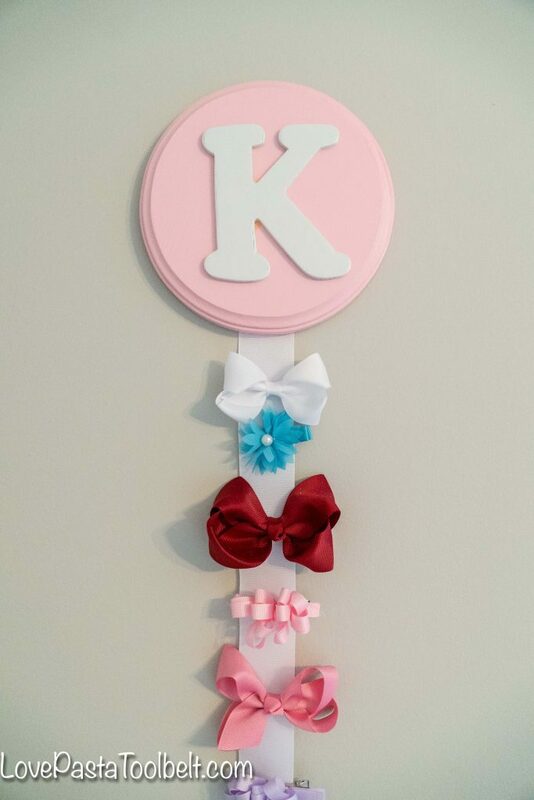 I chose to spray paint the round wood piece light pink, the same color as the K in her room and decided to spray paint the K white. The wood heart that I used to weigh the ribbon down I spray painted light pink. 3. I picked up some wide white ribbon for my bows to clip onto. We used the staple gun and stapled it onto the back of the round wood piece. 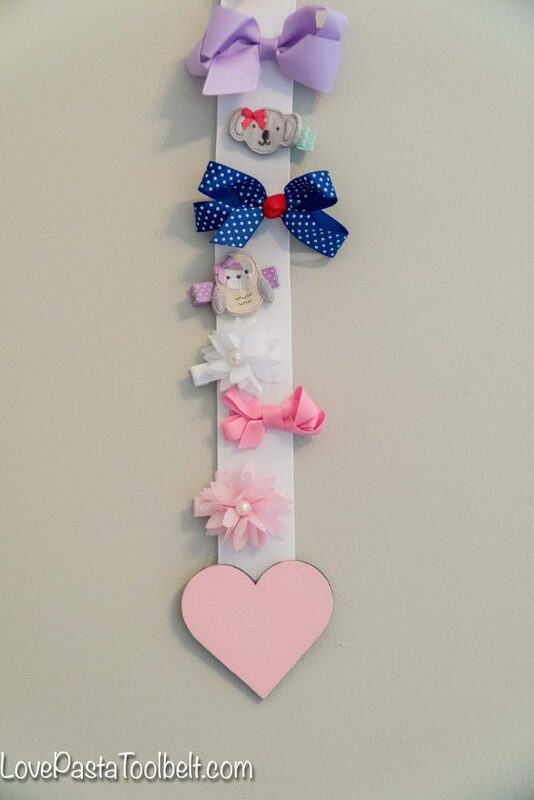 Because the wooden heart was so thin we hot glued it to the bottom of the ribbon to keep the ribbon hanging straight and flat. 4. 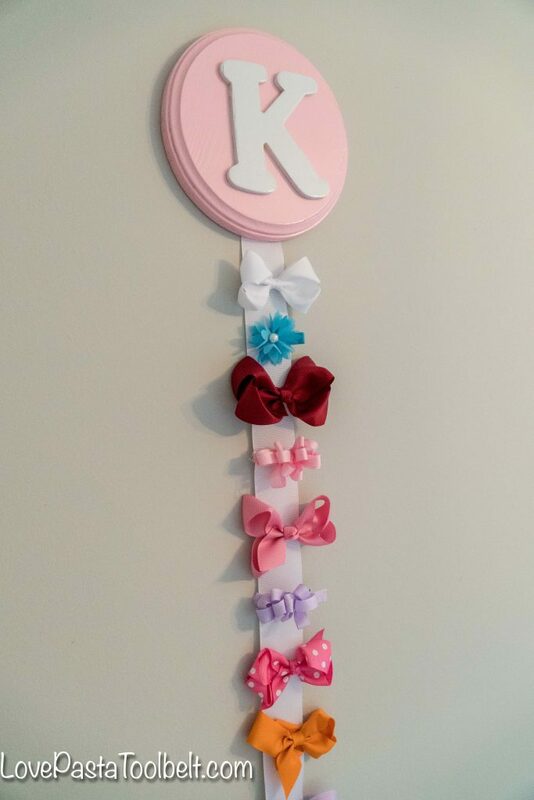 After putting the ribbon and wood pieces together you then take your bows and clip them onto the white ribbon and then you have a cute way to both display and organize your little girls bows. I love how this turned out! I was in the craft store one day and just started seeing supplies for this and got inspired. Now if I could just get inspired for a headband solution because K has over 30 headbands and counting (I may have a problem). 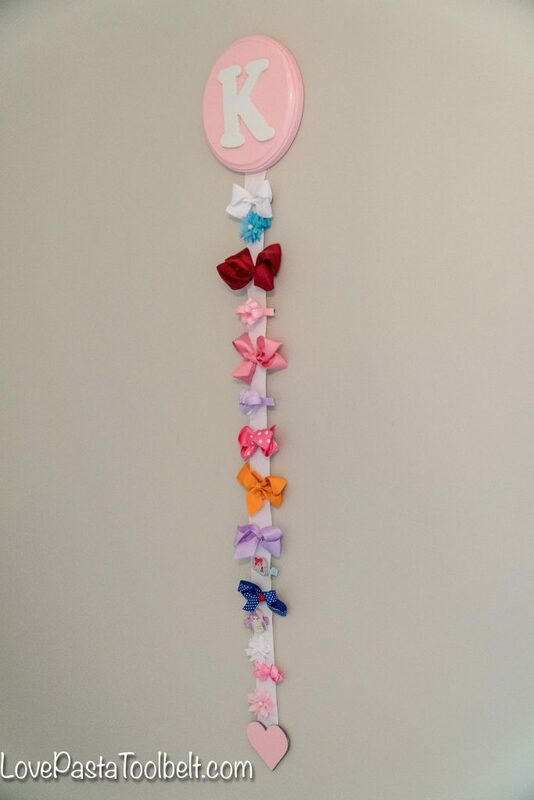 Any ideas for headband storage solutions?